Today am going to do an in-depth review of Alesis Command Kit which is becoming a trend among many drumists nowadays. Let us jump into it now. Finding a perfect drum for beginners as well as for professionals it’s not a simple task. As far as I concern at least. But recently I had come across one of the best what I think which may suit for both beginners and pro level drummers. If you are looking for an authentic drumming experience, then Alesis Command 8-piece Electronic Drum Kit is tailor-made for you. So, I would suggest you give a few minutes of your time reading the Alesis Command Kit review before buying this product. 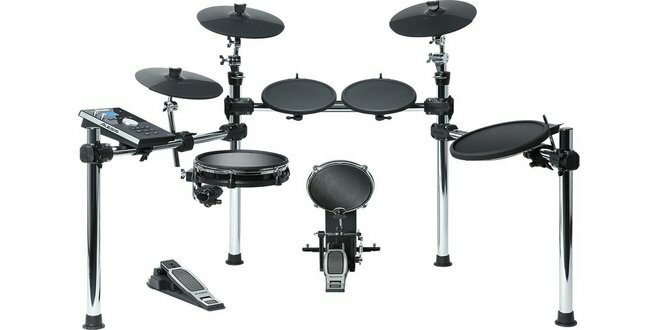 Alesis Command Kit comes up with an eight-piece electronic drum kit having an 8” mesh kick as well as 10” mesh snare drum and also 11” dual-zone floor tom as well as two 9” dual-zone rack toms. The following set is also equipped with 10” hi-hat, 10” crash with a choke as well as 10” ride cymbal. Furthermore, it has 70 drum kits which have a collection of 600+ sounds as well as 60 tracks that you can play. Moreover, it is built with premium chrome, and thus it is very long lasting. It can also be an excellent alternative for Alesis Forge Set. The Alesis Command kit is suitable for both experienced as well as a beginner drum player. Besides this, you can load your samples as well using the USB memory stick input. Alesis Command Kit is also built with the right collections which include 5-Pin MIDI in and output, 5-Pin MIDI in and output, 1/4-inch stereo main outputs as well as a USB output to give you a great experience. So, Let us now move down to the features of Alesis Command Kit. If you like to beat the drum hard or perhaps looking for a drum that lasts for an extended period, then Alesis Command Kit is a perfect product for you. It is made using Premium chrome rack which allows you to have a steady player. This means you can beat the drum as hard as you can without breaking it. Besides this, the rack is light weighted, and it weighs around 1.1 lbs even with having chrome in it. So, this typically makes it one of the best drum to buy. One of the best features of Alesis Command Kit is the Mesh Kick and Snare feature. The Mesh is considered as one of the best surfaces for the people who love playing drums. The reason behind this is it gives you a great bounce combines with great audio experience. Furthermore, if you are living in a gated society or a place where noise is restricted, then this drum is an ideal product for the session of the following drum won’t annoy your neighbors. Also, with the Mesh Kick and Snare, you can hit the drum as hard as you want. Alesis Command Kit is packed with 70 kits using which you can play 600 sounds as well as 60 built-in tracks to play. To boost your drumming skills, it is also equipped with a metronome and perhaps a 1/8” input which you can use for playing with the mobile phone device which can be quite beneficial if you are playing on a stage or studio. Also, if you want to play with your favorite virtual instrument plugins, then it has headphone outputs, ¼ -inch outputs as well as headphone output available for you. 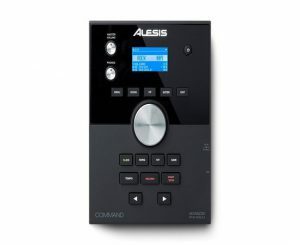 Alesis Command Kit is also equipped with an input of USB memory stick. Using this, you can load your favorite samples that you like and thus it offers you ultimate flexibility and comfort. Once those samples are provided, you can place them in any area of the pad available in command kit. Furthermore, you can experience unlimited sonic possibilities. Besides this, you can place the WAV files of tracks that need to be played using the following input. Here are the merits and demerits what I collected from my friends who already using this electronic drum kit. Worth the money: Alesis Command Kit is available at a Jaw dropping rate, and it is built-in with great specifications and features. Thus, it is worth the money that you would be paying. Great customer support: The customer support of the Alesis Command Kit is quite good. They are equipped with major service stations to fix up the issues if faced any. Moreover, they can assist you 24 * 7 in case you face any difficulty. Easy to understand: It comes with an easy to understand user manual as well installation guide. Moreover, the equipment comes up with a hassle-free system which is quite easy to use. One year manufacturer warranty: Alesis Command Kit comes as a trusted brand, and thus it offers you a one-year manufacturer warranty on the following product in case you face any problem. Hi-Hats might be less audible: If you are buying an Alesis Command Kit, then you may experience less audible Hi-Hats. You may change the trigger, or change the sensitivity pads to check whether as an increase in the volume of Hi-Hats has been witnessed. Pads available might not be of excellent quality: Almost all the pads in the Alesis Command Kit are not made of excellent quality materials. At the following budget, you can expect semi-decent pads for your drum. Where can I see the reviews, price, and availability of the Alesis Command Kit ? The Alesis Command kit is filled with a lot of exciting features, and it is equipped with the latest specification. Furthermore, it gives you the great music experience, and it provides the best value for money. This kit is available at most famous online store Amazon. Below is the link to reviews, price and more photos. Conclusion – My Final Intake! It comes with an affordable price and perhaps with a name that can be very much trusted. Considering the power packed features and specifications, it is certainly a great pick. It is nicely suited for the beginner as well as seasoned professionals, and they can be greatly benefited by it. Furthermore, the mesh pads and steady rack present in the drum gives you an authentic music experience which can be appealing to everyone. Whether a musician, budding basher or perhaps home studio enthusiast, it is typically suited for everyone. So, don’t hold back and buy this excellent product to unleash the best drumming experience. Yes, they have a MIDI out and USB out that allows them to drive DAWs. Although the Alesis Command Kit can be used as a MIDI controller to trigger plugins on a computer, plugins cannot load onto the drum kit itself. Plugins will require an OS like Windows or Mac to run so they will only work on computers. Hope you enjoyed Alesis Command Kit review and cleared your doubt. I read your post and it’s so informational, good job and keep up the good work. Thanks a lot. Hope you enjoyed reading it. I have just read your review on the Alesis-command-kit. This system sounds great for an absolute beginner like myself. The fact that you can load your favorite samples from your own USB Drive is great, which means l would be able to play along with the tracks. After reading your review l am wondering if the Command X drum module can connect to a computer? Also would l be able to save any of the Kit to my USB flash drive? I was looking for a decent electronic drum set due to me not living in a well sound isolated environment and neighbours can be disturbed wildly by the sound of an actual acoustic drum set. I was always a fan of Roland drum sets, but Alesis now seems like a good variant after your review. It’s pretty precise and you can do an incredible amount of things with it!! Thanks for the complete review of Alesis Command Kit. You are welcome. Hope you really enjoyed the article. Whoa never seeing in my life an electronic device like that pretty pretty interesting, I love music and i think I am really decent in the percussion since I always tent to hit the table with the rhythm of a music that i like and because i think i have my dad genetics he is a musician hehe.